We needed a twist on our usual pasta dish and I was craving some Spring time food, so I made some tweaks to my bruschetta appetizer and created a Bruschetta Chicken Pasta with a Balsamic Reduction. I started out with two chicken breasts that I sprinkled with Italian Seasoning and then pan seared until the juices ran clear. It was about 6 minutes on each side, but would depend upon the size of the chicken breast. In the Spring or if you have nice weather now, I would recommend grilling the chicken. 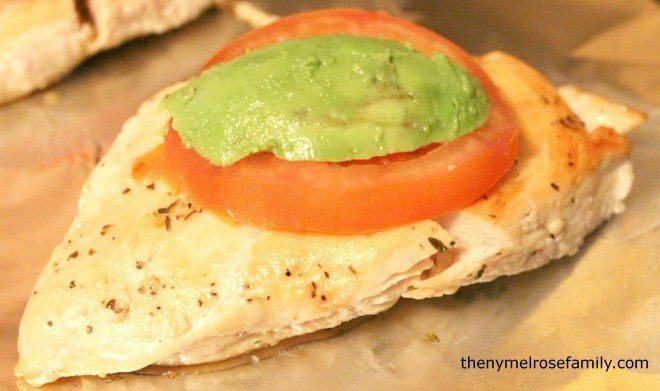 Once the chicken was cooked through I placed a slice of tomato and avocado on top of each chicken breast. In the Summer I would likely use fresh basil, but I had avocados on hand because they are Riley’s favorite. Yes, my three year old willingly chooses to eat avocado over french fries. Who knew?! On top of the avocado I placed a slice of mozzarella cheese and placed the chicken in the oven to broil in order to melt the cheese. Meanwhile, I was making my first balsamic reduction, which was actually much easier than it sounds. 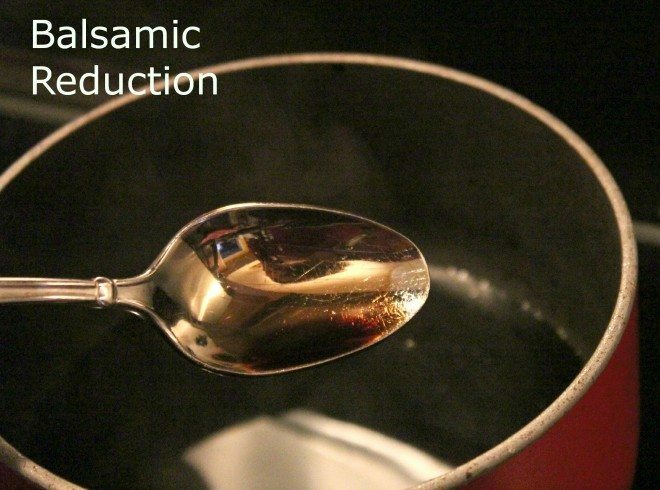 All a balsamic reduction is a cup of balsamic vinegar brought to a boil and then simmered until it coats a spoon. So easy and tasty! In order to plate the meal, you’ll place the chosen pasta in the dish and then place the bruschetta mixture on top of the pasta. We usually choose bow tie pasta because Riley calls them Minne Bows, which came about at her Minne Mouse 2nd Birthday party. Once the cheese is melted the chicken is plated on top of the bruschetta mixture and then drizzled with the balsamic reduction. 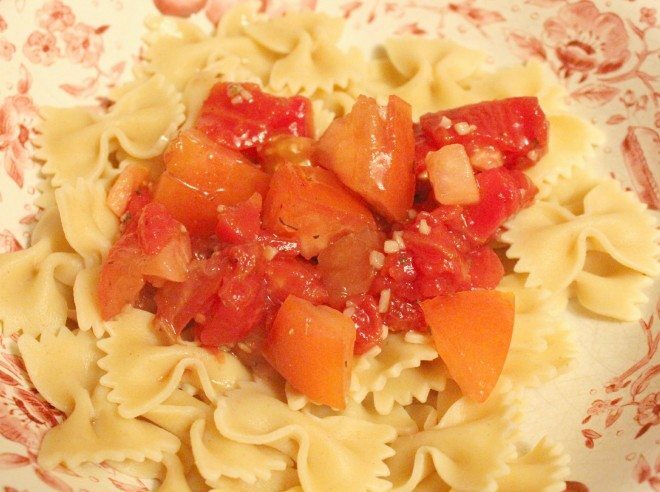 A light pasta dish that has fresh ingredients. 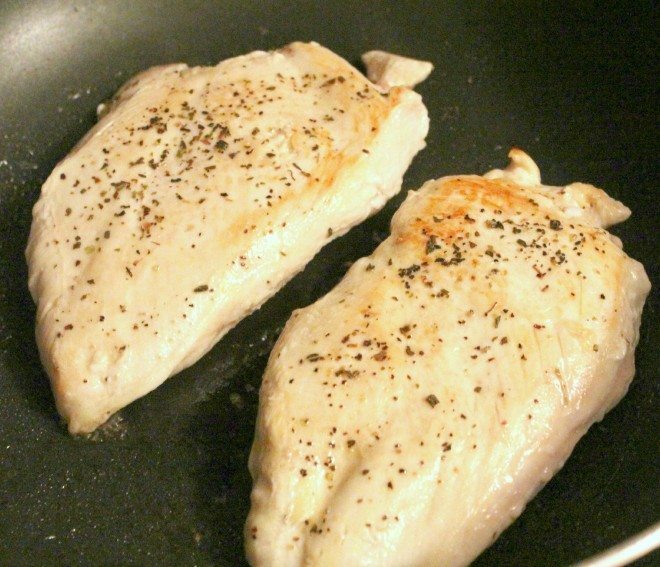 Sprinkle each chicken breast with Italian Seasoning and cook each breast until juices run clear. Cook about 6 minutes on each side. Boil water for pasta and cook the pasta according to the directions on the box. 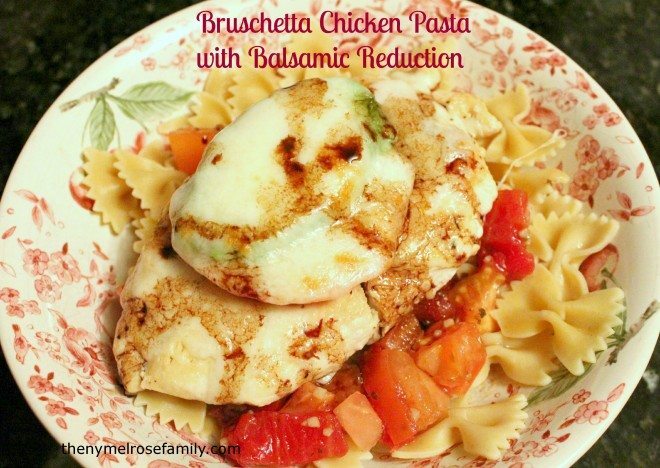 While the chicken and pasta are cooking, pour 1 cup of balsamic vinegar into a pan and bring to a boil. Once it boils turn down to simmer until the reduction coats a spoon. For the bruschetta mixture, combine the cans of tomatoes, garlic, olive oil, balsamic vinegar, salt, pepper and basil. Once the chicken is cooked. 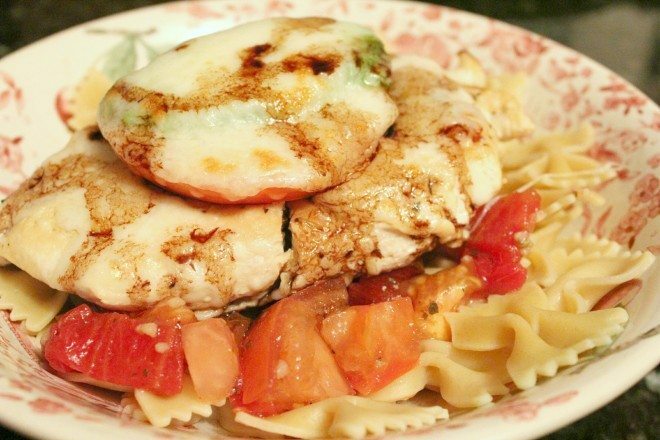 Place the chicken on a foil lined cookie tray and top with tomato, avocado and mozzarella. Broil on high to melt the cheese. To plate place the cooked pasta in a bowl. Top with the bruschetta mixture and then place the chicken on top and drizzle with the balsamic reduction. Pinning this for the summer! I think it’ll be great with grilled chicken! Thanks so much Carrie. I definitely agree that it’s perfect for the Summer and grilling. I would also use fresh basil from my garden in the summer instead of avocado. This looks really good! I may try it next week, planning menus tonight! This Chicken/Pasta recipe looks delicious.